Who's Ready For Year 5?!?! Go S'west Young Man! Free Admission - 10am-6pm - Saturday, April 27th! 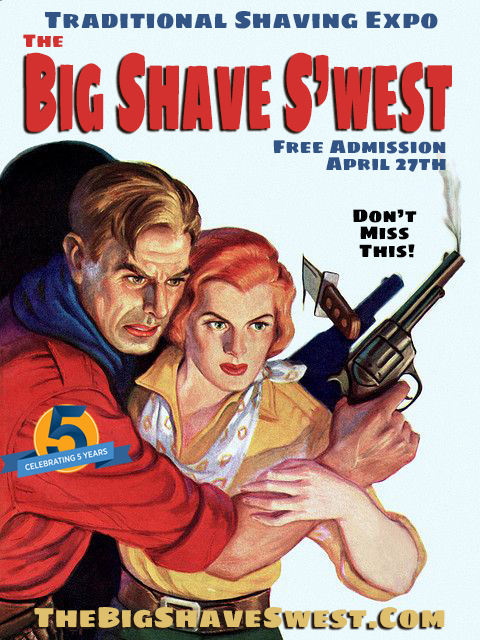 What to expect at a Big Shave Event? and sooooooo much more to be announced this year! Pacific Shaving - Blackland Razors - Edwin Jagger - The Holy Black - Phoenix Shaving - Razor Emporium - King Shave - Gentlemen's Nod - Colorado Razor Designs - Henri Et Victoria - Van Yulay - Wet Shaving Products - Razors By Jerry Stark - Be Shaven - Rich Man Shave - Cooper & French - Frugal Shave - Wild West Brush Works - Sharpologist and The Gentleman Scofflaw! Only 38 Days Away! I am so much looking forward to hanging out with all of you and this epic community event! Come one, come all!